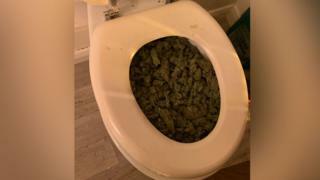 A cannabis farm was flushed out when police found a large haul of the drug stashed in a toilet. It was an "unorthodox hiding place", officers said after finding the cannabis buds at the factory in Thetford, Norfolk, on Sunday night. Police also found cannabis and other plants at a property in Brandon, Suffolk, during the operation. Three people were arrested in connection with the discoveries, and they have since been released on bail. Cannabis was also found in a vehicle outside one of the addresses and the electricity supply had been bypassed at both sites, Sgt Marcus Wall of Norfolk Police said. After he posted a photograph of the drug-filled toilet with a comment about the location being "unorthodox", one person quipped that the hiding place was "pretty bog standard nowadays". Another wrote: "That will drive you round the bend trying to get that lot out."